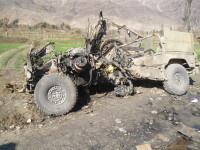 IED Strike against ODA in Kunar Province, 3 January 2005. Sergeant Jeremy Wright, 1st Special Forces Group (Airborne). Winter 2004. Afghanistan. SHELBYVILLE, Ind. 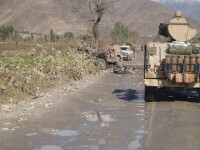 — A bombing in Afghanistan killed an Army special forces soldier from central Indiana who was a cross country champion at Wabash College, military officials and family members said. Sgt. Jeremy Wright, 31, was killed Monday during a patrol when his vehicle struck a roadside bomb near Kabul, the Army Special Forces Command at Fort Bragg, N.C., said in a news release. Two other soldiers were seriously wounded and taken to a military hospital in Germany. Wright joined the Army in 2002 and was sent to Afghanistan about two months ago. He was a Green Beret stationed at Fort Lewis, Wash.
Wright, the Indiana 3,200-meter champion in 1992 at Southwestern High School in rural Shelby County, was a two-time All-American in cross country at Wabash, where he won seven Indiana Collegiate Athletic Conference distance running championships. He was also a three-time member of the U.S. Mountain Running Team. He won the NCAA Division III Great Lakes regional title in 1993 and graduated with honors from the Crawfordsville school in 1996 with a major in chemistry. He also was a member of its Athletics Hall of Fame. Wright had received several decorations including the Purple Heart. Survivors include his mother, Jackie Nickel, and his father, Dale Wright. 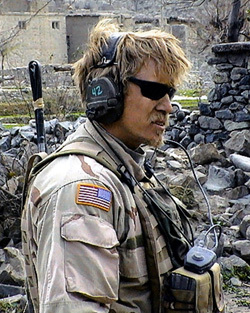 Wright is at least the third person from Indiana to have died in Afghanistan or Pakistan since America’s anti-terrorism operation began there in late 2001. Marine Sgt. Jeannette L. Winters, 25, of Gary, and Army Pfc. Ranger Matthew Commons, 21, who grew up in Indianapolis, were both killed in 2002. At least 118 U.S. soldiers have died in Afghanistan during the Enduring Freedom campaign.